Dog Sled Saga. How could I resist! One of the benefits of the indie boom in the last few years is games are now being made with niche themes and settings; think 'Papers, Please' and 'Cook, Serve, Delicious'. And this is great. We are expanding our gaming horizons and the industry will be better for it. 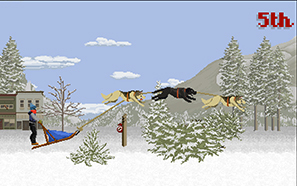 So, Dog Sled Saga is currently available as beta. You've been hired as part of a dog sledding team and you need to work your way up the leagues. 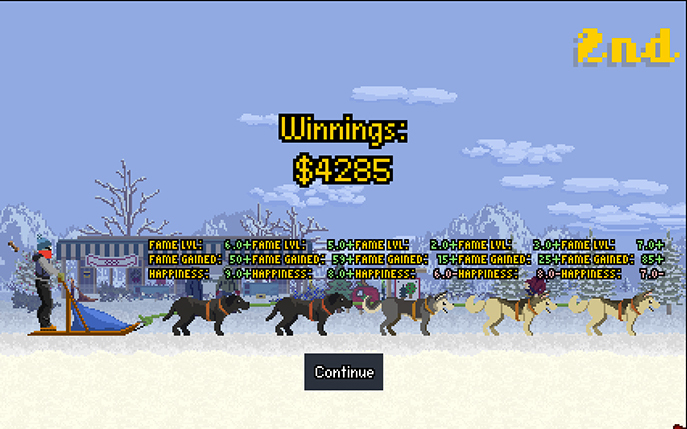 You can hire three dogs of your choice for free at the start and race immediately. There is a deceptively high amount of mechanics at play in the game. 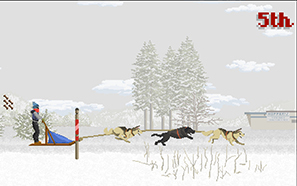 Each dog has a strength and a weakness, a special ability and a preferred position in front of the sled. Special abilities activate when special circumstances are met. My dogs have Second Wind; a burst of speed when energy is low, and Competitive; where the dog speeds up if close to an opponent. Getting these right are vital for finishing in a podium position. There are also obstacles on the track; logs to jump over, trees that block food (I'll get to that later), and wind. You race at several times of day, another aspect that affects the dog's performances, and the quality of snow can differ. The dogs, naturally, will get tired while you race. To prevent this you need to give them food. By holding down the spacebar you get an ever increasing arc and you let go when the treat will reach the desired dog. You are limited to six at a time but there are several restocking areas in each race. It can get stressful if you manage timings poorly and are left with three hungry, slow dogs and seeing your opponents catch up and overtake you. The dogs can get tangled in the leads. This severely decreases speed and a few swift clicks will untangle them. There are also happiness meters; include in too many races without a rest or racing in unfavourable conditions affect this. Each dog can gain fame too. 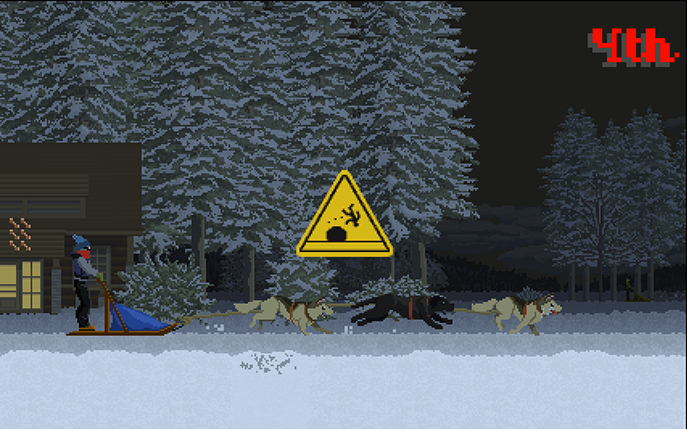 Dog Sled Saga seems pretty great and is not complete yet. The gameplay is essentially about being organised and arranging things in the most efficient way. I wish the sled would go slightly faster at top speed (it may well do with better dogs) and hope an online mode is added (that would be so cool!). 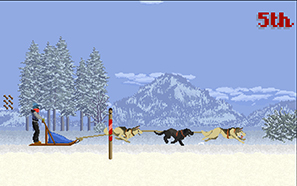 Dog Sled Saga already has a great amount of personality and you get your money's worth even at this stage for £6.40.